The last few weeks of warm weather have turned all the green tomatoes on the vine to bright red! 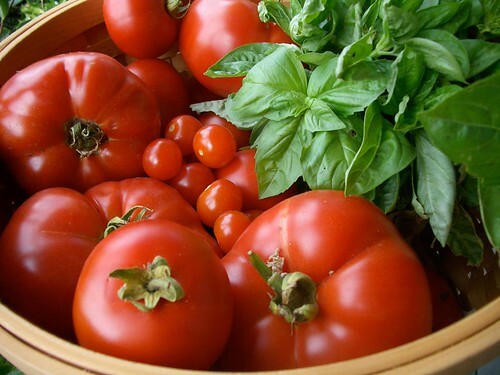 The question is what to do with a ton of fresh tomatoes? Make tomato soup! I love this recipe for tomato soup because it is so incredibly easy and so delicious. The best part about making this soup is that is freezes perfectly. Pour the soup into freezer-safe plastic containers and freeze. Then on a cold winter’s evening when you don’t feel like cooking just pull a container out of the freezer and defrost in the microwave, then heat up and serve. The soup is creamy, smooth with lots of delicious fresh tomato flavor. The original recipe calls for heavy cream but I prefer to use milk to keep the soup a little less heavy but still creamy. The secret to this easy-to-make soup is that you use a blender to puree everything smooth and creamy. No need to peel the tomatoes! This soup is great on its own but you can really make it special by baking up some homemade croutons to add a little crunch to the soup. Homemade croutons are so much better than store-bought and they make terrific snacks as well as a topping for your soup. Here is how you can make your own, based on a recipe that I got from an older Martha Stewart magazine. I always go ahead and double up this recipe whenever I make it because it’s just as easy to make a double batch and freeze half since you already have everything out and getting dirty anyhow. Melt butter in medium saucepan over medium heat. Add onions and garlic and saute for around 3 minutes. Add wine, chopped tomatoes, salt and pepper. Cook until tomatoes are falling apart, around 5 minutes. Stir in basil and remove from heat. Let mixture cool slightly. Transfer mixture to blender, filling the jar no more than halfway. Cover the lid with a towel before blending until smooth. Work in batches, pouring the pureed soup into a large bowl. When all the tomato mixture is pureed, transfer back to the saucepan and add the cream (or milk), adjust the seasonings to taste. Preheat oven to 400 degrees. 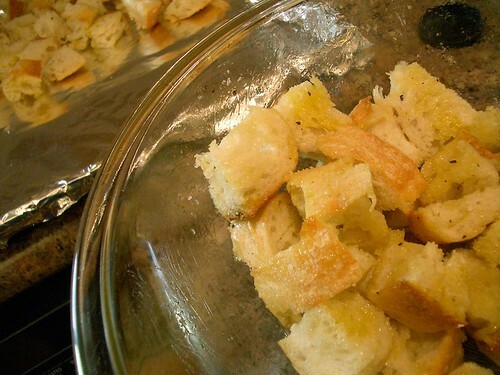 In a medium bowl, toss the cubed bread with the olive oil until evenly coated. Sprinkle with the salt, pepper and dried italian herbs if using and toss to coat the bread evenly. Spread the bread in one layer on the prepared baking sheet and bake for around 3 or 4 minutes until golden brown, toss the bread so that all sides get evenly browned. Watch carefully so that the bread doesn’t burn. Let the toasted bread cool slightly before adding to the tomato soup or storing in a ziplock baggie.